Extreme durability that will endure beautifully for decades. The unique resilient properties of FlexiFlor provide a long-term low cost floor covering solution for the most demanding building environments. Thoroughly field tested for over 80 years in the education, healthcare, and commercial markets. FlexiFlor is the long-established brand name for resilient rubber flooring products designed, manufactured, and brought to market by SRP Industries. Our sheet rubber flooring and rubber stair treads have been the premium choice for thousands of schools, hospitals, and commercial facilities over the last eight decades. Our entire organization works as a team, combining our talents to consistently deliver the highest quality products and service. We find that Flexiflor rubber flooring is consistently durable, easy to install, priced competitively and a favorite of many school districts in our area. The Lincoln Public School system has been using FlexiFlor for over 25 years and have found it to be easier to clean than other rubber products. The ease of maintenance has saved us quite a bit of money throughout the years. FlexiFlor is also more durable than others. In fact, we did an entire school renovation and left the FlexiFlor because it still looked that good! Because of the wearability, appearance, quietness, ease of maintenance, and ease of walking on it . . . we use FlexiFlor. We have some in a heavy traffic area that's 30-35 years old and it still looks excellent. Collins and Rimer Architects Inc. Remarkable...the only flooring at our facility that actually seems to improve in appearance as it gets older. Daily maintenance is just dust mopping. We spray buff every other day and that pulls out scuff marks and such. We believe that sheet rubber flooring is more resilient and, therefore, more comfortable for our nurses who must spend long hours on their feet. It is attractive and extremely easy to care for. The stair treads which we have in adjacent areas are also attractive and durable. I believe that our labor and material cost for maintenance is lower than for any other floor covering now available. With over 80 years of manufacturing sheet rubber flooring and rubber stair treads, FlexiFlor® products continue to stand the test of time with installations throughout the globe. Located in the Rubber Capital of the World with many of our raw materials sourced locally, we are able to both minimize environmental impact as well as meet customer demands quickly. Today our focus remains on planet health by bringing to market long-lasting environmentally friendly flooring products through responsible manufacturing. Read Installation Instruction and SDS thoroughly prior to installation. Use a double barrel caulk gun to dispense the Epoxy Caulk. All surfaces must be clean, dry, free of dust, grease, paints, oils, and any other foreign material which may interfere with proper adhesion. Smooth areas must be roughened with 60 grit sandpaper or a grinding disc. Epoxy Caulk will not adhere to cured epoxy without sanding or grinding. The Epoxy Caulk and the room temperature should not be less than 70°F (20°C) for 72 hours prior to, during and after application. Depending on the amount, the mixed caulk has a life up to 45 minutes. Place dual-cartridge in dispensing gun and remove end cap. Attach mixer nozzle and retaining nut. Dispense caulk; discard the first 1 – 2 inches of caulk. If step needs repair, apply Epoxy Caulk directly to the step surface to fill depressions, holes, cracks and repair step edges. Use a putty knife, trowel edge, etc. to smooth surface. If repaired areas become fully cured (1-3 hours) before tread installation, sanding will be necessary. See Step 3. Apply appropriate stair adhesive (# 56 Latex, #5 Epoxy or Neoprene contact) per label instructions. Apply a sufficient amount of the Epoxy Caulk inside the nosing of the tread so that when the tread is pressed firmly in place, the caulk will conform to the front of the step edge. Thoroughly roll tread with a J-type hand roller, especially in the nosing area. The nosing area of the tread must be in 100% contact with the step edge to provide adequate support and eliminate any gaps. 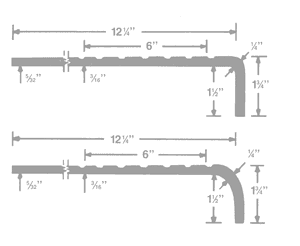 Coverage – Approximately 50 lineal feet per unit at 1/4” bead. Do not allow traffic until 48 hours after installation. CAUTION: This Epoxy Caulk cannot be removed from surface after it has cured without causing irreparable damage to the product surface. If spilled, remove immediately with a clean cloth and a solution of warm water and detergent. Clean equipment with a solution of warm water and detergent. To save a partial cartridge of caulk for future use, leave the mixing nozzle and retaining nut in place on the tube. Material will cure inside the nozzle, but not at the base where the nozzle screws onto the cartridge. To use the remainder of the cartridge, remove the old nozzle and replace with a clean nozzle. 1. Be sure underfloor is dry, clean, smooth and free from foreign matter. 2. Pour Part “B” into Part “A” and mix until completely uniform. Bond strength depends on efficient mixing. 3. Do not mix more adhesive than you can spread in 30 minutes. A complete unit of Part “A” and Part “B” should cover approximately 150 square feet per gallon unit. 4. Do not allow mixture of Part “A” and Part “B” to remain in the container longer than 30 minutes. It is best if the mixed adhesive is immediately poured on the floor and troweled. 5. Mix and spread the adhesive at a temperature of approximately 70°F (21°C). Use a trowel with fine notching, (notches 1/16” wide, 1/32” deep and on 1/16” centers). This should cover 150 square feet per gallon unit. 6. Do not place flooring in adhesive too soon. Allow 30 minutes for adhesives to partially set before laying flooring. This prevents flooring from slipping and adhesive oozing through joint or seams. 7. Do not kneel or walk directly on flooring as installation progresses. Kneel on piece of plywood or Masonite. 8. After flooring has been in the adhesive of one hour, cross roll thoroughly with a 100 pound sectional roller. It may be necessary to weight seams until a suitable bond has been established. 9. Do not place heavy furniture or allow heavy traffic until 48 hours after installation. 10. Clean flooring and tools with warm soapy water before adhesive hardens. 1. Flooring materials and adhesives should be stored in a pre-heated building where room and substrate temperature should be no less than 65° F, 24 hours before, during and after installation. 2. 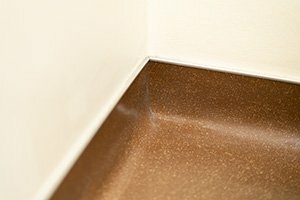 Sub-floors must be cleaned, free of dust, dirt, grease, wax, paint, curing or parting agents or any other substances that may affect the bond. Concrete floors must be level, fully cured and free of excessive moisture emissions and alkali. Maximum moisture emissions of 3lbs/1000sf/24hrs ASTM F1869, pH 7.0-9.0. The relative humidity of the substrate should be 75% or less ASTM F2170. Very porous substrates should be primed with a compatible acrylic primer. 3. Trowel recommendations: 1/16 x 1/16 x 1/16 square notch, approximate coverage: 125 – 150sqft per gallon. 4. If sheet goods are to be installed, cut to fit before spreading adhesive. All seems must be overlapped and double cut. Allow the adhesive to tack properly and maintain proper trowel notch and adhesive delivery throughout the entire installation. 5. Lay floorcovering into the adhesive as to minimize air bubbles and wrinkles. 6. Roll flooring with a 75-100lb roller in both north-south and east-west directions to ensure 100% transfer and to remove trapped air. 7. Restrict foot traffic for at least 12 hours and DO NOT move heavy objects on carts over the finished flooring for at least 48 hours. 1. A clean substrate is ESSENTIAL! Thoroughly sweep and vacuum the substrate first. Damp mop to remove any remaining dust or debris. Extra attention to substrate preparation is essential for a successful installation. 2. Shake can well before each use. Point can downwards, press the side of the nozzle tip as you slowly walk back and forth. Do not use a sweeping motion as this may create uneven coverage. Clean up drips. Be sure to achieve full coverage. When using on a non-porous substrate, a lighter application may be necessary. NOTE: It is up to the end user to determine the coverage that is appropriate for flooring and jobsite conditions. Bond testing prior to the installation will help identify the appropriate application rate, open and working time, and any potential bonding problems to the substrate or flooring. To determine the accurate coverage rate, measure and chalk line the substrate into grids (using the appropriate square feet of area for the adhesive application) and spray the entire can of adhesive onto each measured grid area. 3. Allow the adhesive to dry completely with no transfer to fingers when lightly touched. Open time will vary depending on the adhesive coverage, substrate porosity and the ambient conditions. Working time for the adhesive should not exceed 4 hours. 4. 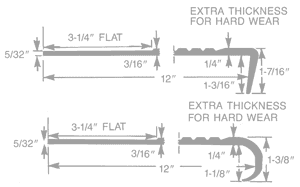 Roll the floor immediately after the installation is complete with the appropriate roller specified for the flooring type. Normal traffic and rolling loads may be allowed as soon as the installation, finishing and clean-up are complete. 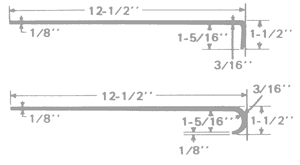 This stair tread is not intended to comply with some aspects of ASTM F2169 as it is not intended for interior use.